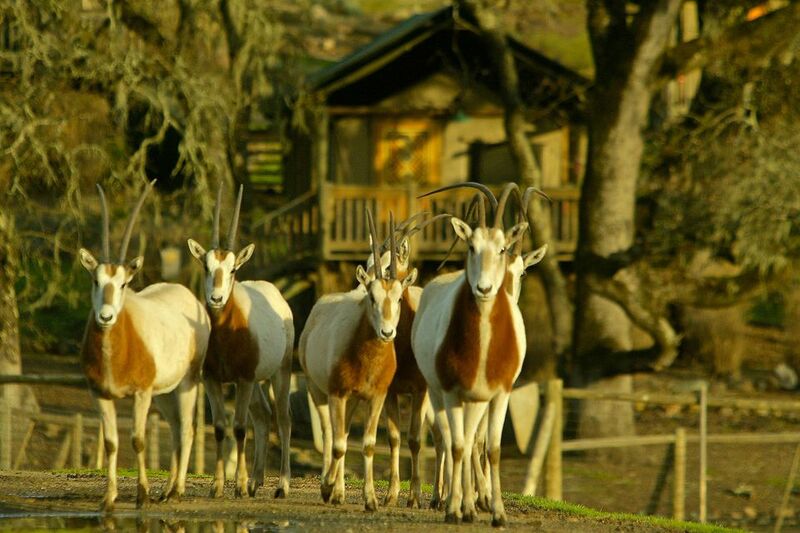 If you've ever wanted to rest in the lap of luxury while surrounded by nature in Napa Valley, Safari West Animal Park may be just the right place for you. Safari West is home to more than 800 wild animals, but it's not a zoo. Instead, the 400-acre wildlife preserve in Sonoma County is part bed and breakfast and part safari adventure. It's closer to home (for most of us) than Africa, located between Santa Rosa and Calistoga, just north of Napa Valley. You can stay overnight in their luxury tent cabins or take one of their guided tours. It's a fun experience for families and for anyone who loves to see wild animals. You even can sip champagne with giraffes and go on safari under the warm California sun. Safari West's jeep tours are open to the public, even if you aren't staying overnight. If you're visiting Napa Valley for a weekend, think about taking a break from the wineries to tour, as Safari West puts it, "the spirit of Africa in the heart of wine country." You can take a three-hour Safari Adventure tour or a 90-minute Serengeti Trek walking tour. You may see zebras, blue wildebeest, cape buffalo, watusi cattle, and kudu. These are only a few of the more than 800 animals that live on the Sonoma Serengeti at Safari West. In addition to their standard tours, Safari West also offers private tours and themed tours, including a Valentine's Day tour that focuses on the mating habits of the animals, as well as more traditional photo safaris and sunset safaris. For the classic adventure tour, children must be at least 4 years old. Toddlers under the age of 4 can join their party on the walking portion of the tour only. Safari West is open for overnight stays March through December. They offer a few styles of luxury tents and serve breakfast. A night at Safari West will cost about as much as a luxury hotel in nearby Calistoga, but on selected dates, they offer discounted rates, which are listed on their website. The accommodations are "glamping" (glamorous camping) at its best, with plush beds, hot showers, polished wood floors, copper basins in the private bathrooms, and one-of-a kind hand hewn furniture. It's the perfect destination for families looking for a bit of adventure and luxury, and friends who want to escape into the wilderness, but want to have a porcelain throne nearby. Children of all ages are welcome. If they're less than two years old, there's no additional charge for them to stay. Visit Safari West for a memorable birthday celebration or just to treat your family to the real inspiration behind the neighborhood jungle gym. Tours are given daily. Reservations are required for both overnight stays and safari tours. Visit the Safari West website for more information. For both your pet's safety and that of the animals, no pets are allowed at Safari West at any time. Service animals aren't allowed on the Safari Tour and they can't stay behind in your private vehicle while you go without them, but there is a crate available to kennel your service animal while you're on tour. Contact Safari West ahead of time to make arrangements. Location: Even though Safari West's address says Santa Rosa, they're actually closer to Calistoga. You can get there from either town. Napa With Kids: Napa Valley can be kid-friendly, especially with places like Safari West and kid-friendly wineries. Although your little ones shouldn't have any trouble staying interested while at the park, it may be fun to create a scavenger hunt for them to play with during the wildlife tours. Enjoy your trip to the park and surrounding areas with this guide to a family vacation in Napa Valley.